Our skin and coat supplements contain a balanced, healthy selection of essential oils. These have the primary aim of helping to restore and maintain the condition of the main barrier protecting your pet against environmental elements and serving as the first line of defence against disease and infection. The supplements moisturise the skin and coat keeping it hydrated by retaining water, which helps to alleviate itching and shedding. Natural blend of Omega oils, together with added Vitamin E, designed to promote healthy skin and a shiny soft coat in cats and dogs. This product is a powerful blend of rich omega oils which are ideal for conditioning an animal's skin and coat, providing a fundamental dietry requirement which is not able to be synthesised within the body. 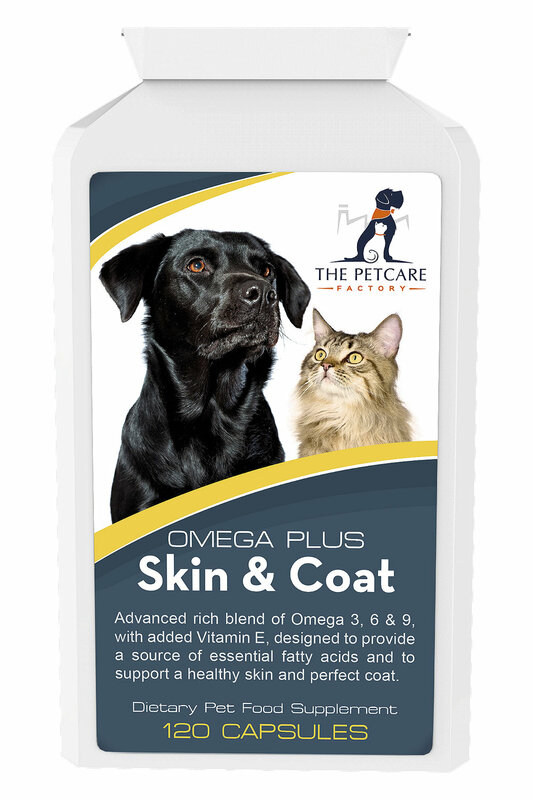 As well as improving the skin & coat, there is evidence that omega based products offer many other benefits including regulating the immune system, reducing inflammation caused by conditions such as allergies, inflammatory bowel disease, and arthritis, helping in the mental development of younger animals and cognitive function of those reaching advanced years and helping to avoid the risk of stroke or heart problems. Free 1st class delivery on all UK orders. Orders dispatched same day if placed before 1pm, Mon-Fri.